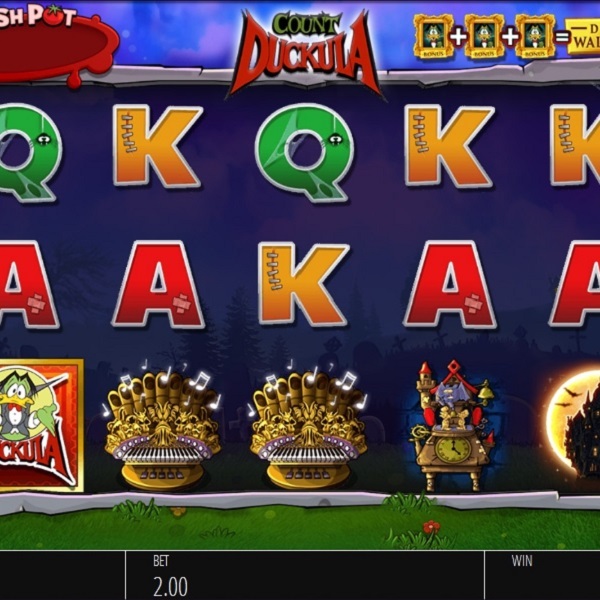 If you remember the old Danger Mouse spin off cartoon Count Duckula then you’ll be pleased to hear that Blueprint Gaming has just released a slot based upon it. It has 5 reels and 40 fixed paylines. The symbols include Duckula’s castle, an organ, a bat, Duckula’s coat of arms and a clock. The stake through the heart is the wild symbol and there is a Count Duckula bonus symbol. On any spin Duckula, Igor or Nanny can appear to award four different bonuses. They include extra wilds, matching symbols, colossal wilds and jackpot symbols. The main bonus game is triggered by landing three bonus symbols on the reels. There are five different bonus games comprised of a mixture of free spins games with sticky wilds, wheel of fortune, picking games, cash prizes and more.